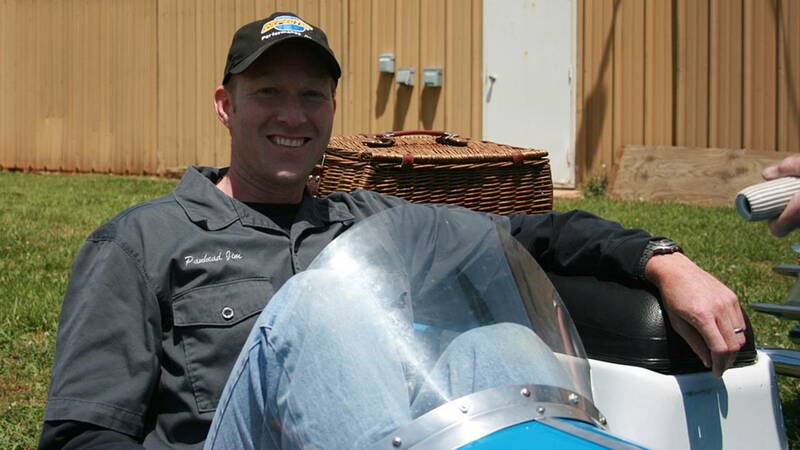 Panhead Jim rides a 1965 Harley-davidson Topper with a sidecar, for our first ever Vintage Review. Harley-Davidson has produced vehicles for seemingly every segment of the transportation sector over their 110+ year history. Everything from rocket engines to golf carts have borne the bar and shield logo over those years, but perhaps one of the most adorable is the Topper. Considering Harley’s current marketing of the “biker lifestyle”, nothing flies in the face of that like two grown men riding on a scooter with a mini sidecar. I have been vaguely aware of the Topper for years, but had never really seen one up close and honestly have a low opinion of scooters in general which kept me from searching one out. 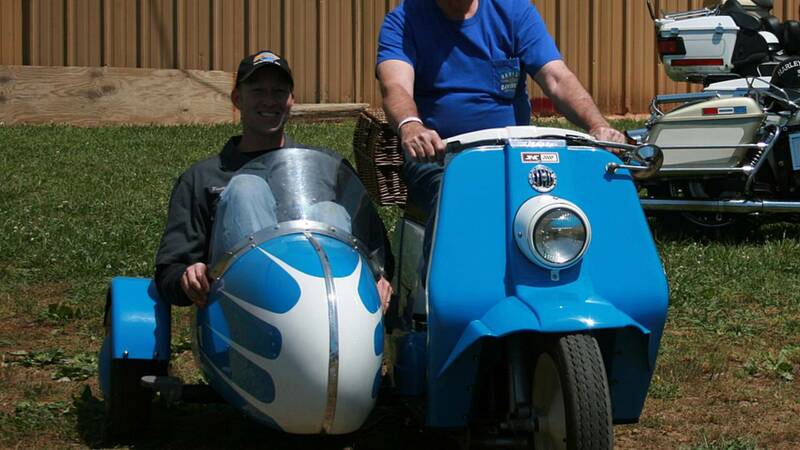 Then last spring, a good friend of mine from Nevada mentioned he would be travelling out to the east coast and was bringing a number of vintage machines along, including his 1965 Topper AH with the rare factory sidecar. If he was dragging that Topper all the way across the country, I figured there must be something to it, so I made sure to arrange for a ride when he was in my neck of the woods. I met up with my buddy, who goes by the nickname Pigpen, down in Denton, NC during the AMCA Southern National Meet. 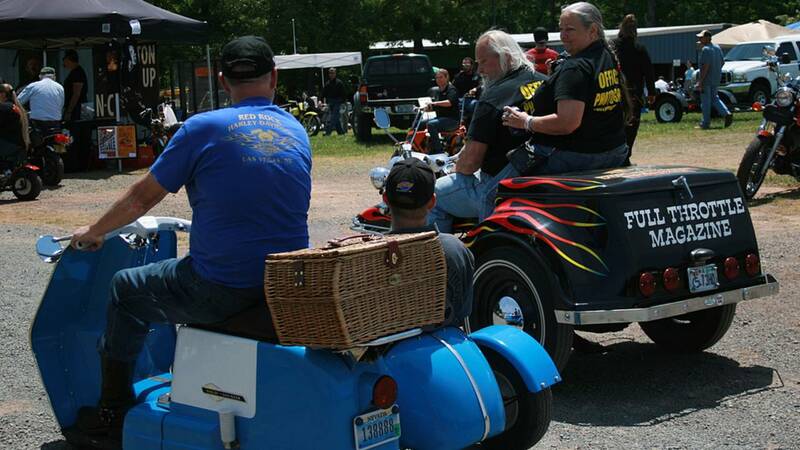 This is an annual swapmeet/bike show/campout for vintage motorcycle enthusiasts and always a good time. 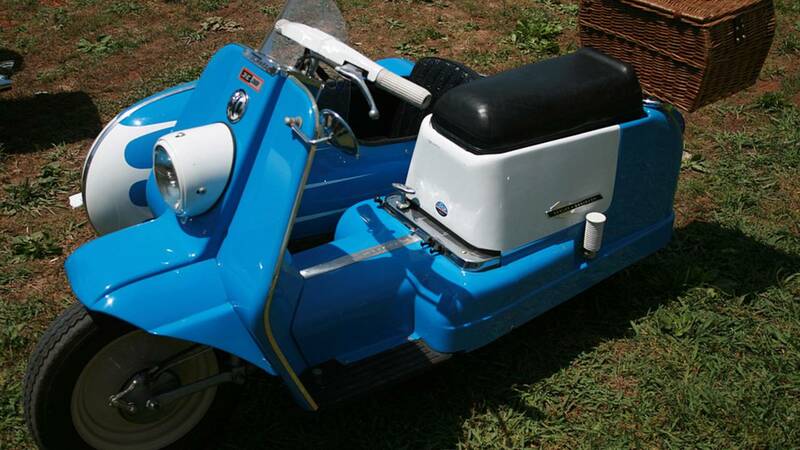 When I found Pigpen, the Topper was all ready to go; it was surprisingly a very striking machine with a flawless blue and white paint job on the scooter and a matching scalloped paint scheme on the sidecar. I volunteered to hop in the sidecar as I’d never ridden in one of those either and thought I’d kill two birds with one stone. The chosen route was around the grounds of the Denton Farm Park which consisted of an approximate 1 mile gravel loop road. This would force us to keep our speed down which was fine with me as I was still a little unnerved by the small wheels and low ride height. 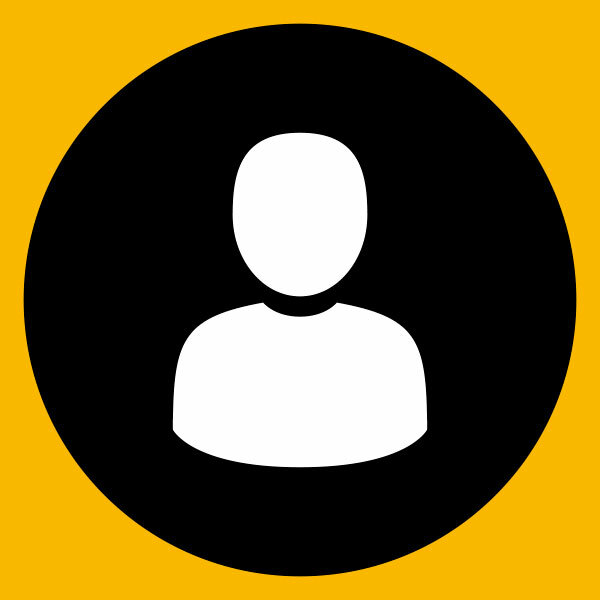 All Toppers are powered by horizontal single cylinder 2 stroke motors that use a reed valve intake. The engine is mounted centrally between the floorboards and cooling is provided by airflow under the scooter. The Topper AH is the hot rod model of the lineup with the “H” denoting high compression. The AH produces 50% more horsepower than the standard A model which means the 165cc engine cranks out 9hp! There is actually quite a bit of engine work needed for this power increase, so the AH is fitted with a larger carburetor, larger intake manifold and larger airfilter along with a tuned exhaust to compliment the high compression squish chamber head. The engine is paired to constant velocity transmission and connected with a v-belt primary. Power reaches the rear tire via a roller chain which spins a 63 tooth rear sprocket. 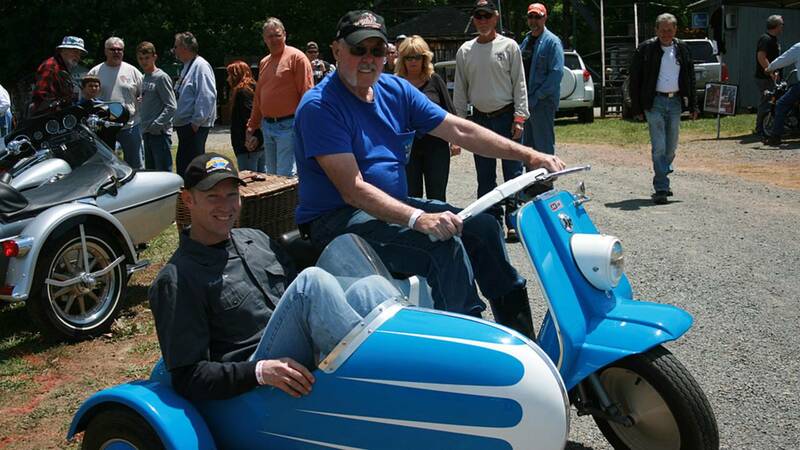 The Topper has a wheelbase of 51.5” and a total length of 75” making just two inches shorter than the current Vespa 946. It rides on a pair of 4.00 x 12 tires, each fitted with a 5” drum brake. The front suspension uses a leading link design while the rear consists of a swingarm attached to two extension springs. 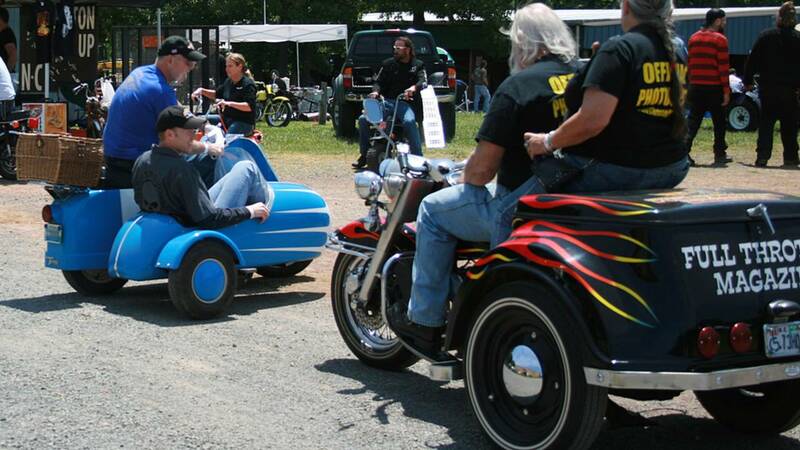 Both the Topper and the sidecar are built around high strength steel frames. The sidecar uses a slightly smaller 4.00” x 8 tire which is attached to a ¾” square torsion bar to provide suspension. The engine is positioned to put 42 percent of the scooter’s weight on the front wheel and to provide a low center of gravity for better balance and handling. 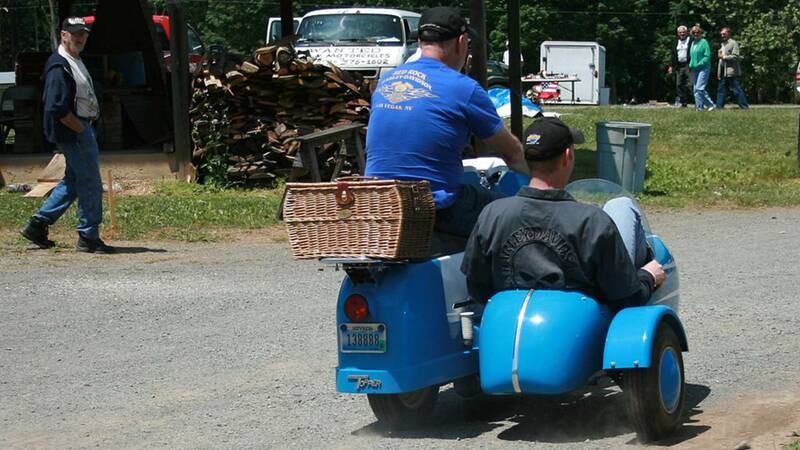 Of course attaching the sidecar negates most of the advantages provided by the engine placement. The Topper uses a 6 volt magneto-generator system to power two low tension coils. One coil powers the headlight, tail light and horn while the other powers the ignition and brake light. For night time operation, the headlight is equipped with high and low beams, both putting out 21 candlepower. Speed is monitored through a mechanical speedometer which displays all the way to the Topper's advertised top speed of 60 mph. No battery is needed as the starting mechanism consists of a rope-recoil type similar to most lawnmowers. Fuel for the motor has to be premixed as oil injected two-strokes had not yet been invented in the 1960's. The advantage being that you can use the same fuel for your Topper as your chainsaw and vice versa. The Topper has relaxed upright sitting position which places the rider's feet directly in front of him. Very similar to just sitting in a chair. The 30" seat height is actually higher than most models in Harley's current line up, being 5" higher than a standard Fat Boy. Although the sidecar was not marketed as a fun way to travel with your children, my 6’2” frame was definitely more than it was designed to hold. Still I was able to squeeze into the sidecar with my knees pulled up to my chest. The sidecar has a bench style padded seat which probably would have been comfortable if I had a little more leg room. 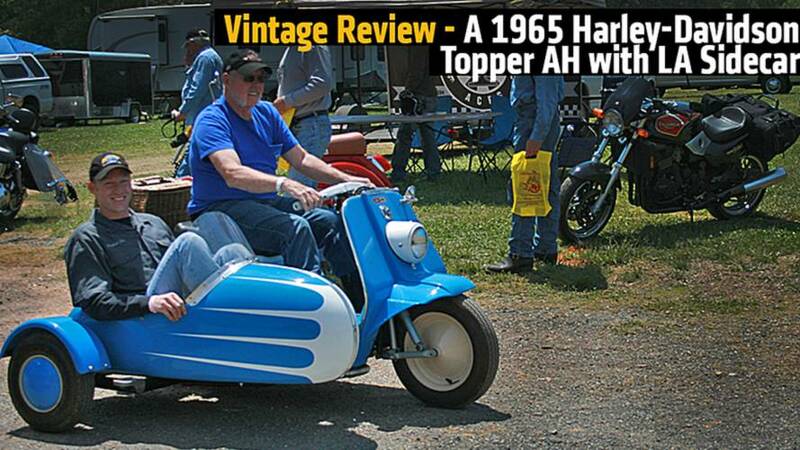 MSRP back in 1962 was $445 for the AH model Topper plus an additional $128 for the LA model sidecar. 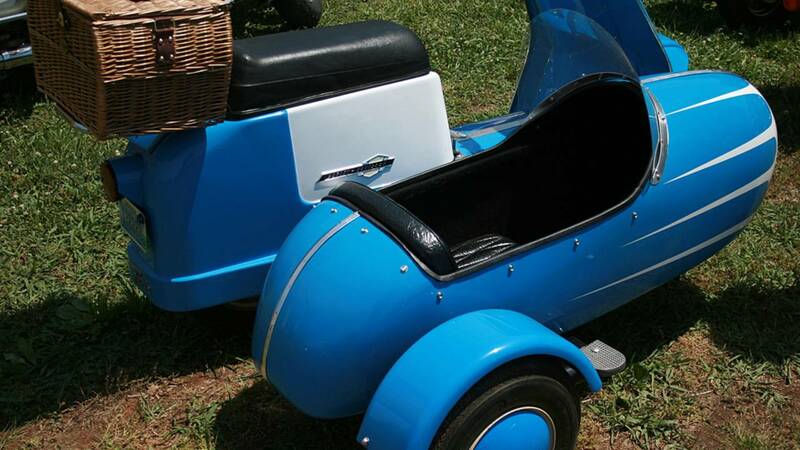 Current market value for a Topper in good condition is in the $3000 - $4000 range and you can double that price if it has a sidecar. Riding in the sidecar brought back memories of my favorite county fair rides from my youth, just shaky enough to make you hold on tight but not so much that you feared for your life. As we bounced down the gravel roads the combination of low ride height and minimal suspension gave me that same amusement park ride feeling that we were traveling much faster than the 25 mph that Pigpen assured me that we were going. Even though it was cramped and a bit uncomfortable, it was a blast to ride. You probably noticed that big grin I had plastered on my face in every photo. I would not want to do 500 mile days on it, but for an around town vehicle it would be a lot of fun. Ideally you'd want to own one of these if you lived down at the coast as it would make the ultimate beach machine. There's room for you, your best girl and even a picnic basket to carry lunch and beach towels. Best of all it is a real head turner. You'll note that in most of the pictures, everyone is checking it out as we rode past and I'm sure they were thinking that I looked like a real "badass" in that sidecar. Probably what surprised me the most is that the Topper is how comparable it is to a modern scooter. If you read the spec sheet on a new Vespa you'll see a lot of similarities and even a few places where the Topper actually outperforms it. Considering that the Vespa 946 has an MSRP of $10499, a nicely restored Topper wouldn't be such a bad alternative.